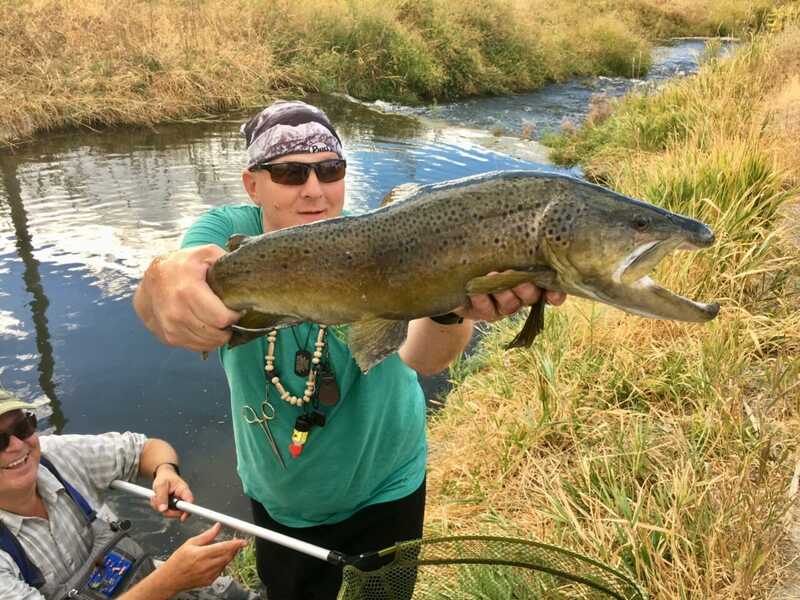 Dan Nelson took some time away from his worries about having Stage 4 brain cancer and ended up catching this beautiful brown trout during a Reel Recovery fly fishing retreat. Photo courtesy of Reel Recovery. n took his time on the water for granted. He appreciated being on the river, of course, but like so many of us, didn’t truly understand what it meant to him on a deeper level. At least not until he was diagnosed with Stage 4 brain cancer. Then it became crystal clear. 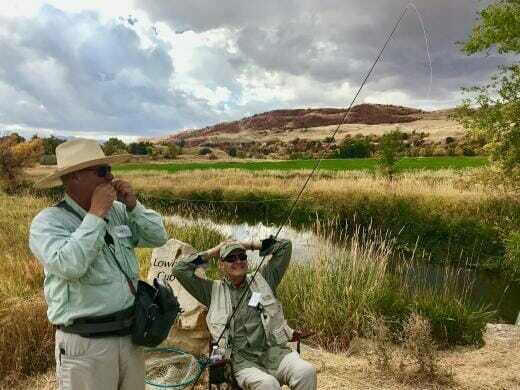 A Reel Recovery participant relaxes while his fishing buddy makes a fly change during a recent retreat in nothern Utah. Brett Prettyman photo. Dan was all smiles at the time because he had caught the largest fish of the morning session among the 13 participants at the appropriately named Sportsman’s Paradise at White’s Ranch in the community of Paradise, Utah. He pulled out his phone to show me the fish he landed earlier and then proceeded to show off some other pictures of a trip he took with his nephew before his diagnosis. I had to leave at the end of the first day of the retreat, but someone texted me a picture of Dan the next day with the fish of a lifetime. I thought Dan was all smiles when I talked him, but can you imagine hooking and landing a giant brown after thinking you may never go fishing again? A participant at a Reel Recovery retreat enjoys a fish he landed with the help of his fishing buddy. Brett Prettyman photo. 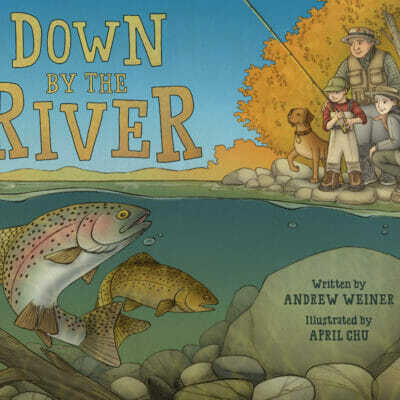 I first witnessed the power of fly fishing as therapy during a Reel Recovery retreat in 2005. I was there as a reporter and can honestly say the experience changed me forever. 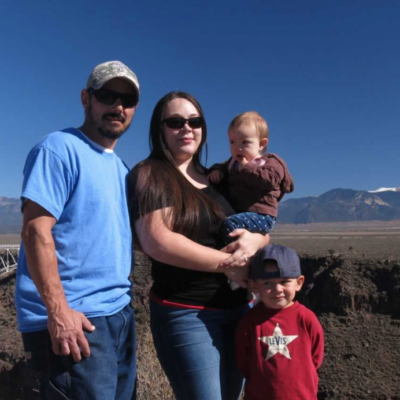 I now serve as president of the national Reel Recovery board because I have seen what being in nature, throwing a fly and being with other people who have been told they have a life-threatening disease can do for people with cancer. We all know, but often fail to recognize, the healing power of fishing. Think about what it means to stand in a river and feel the current and become so occupied with the fishing that you forget everything else. Now imagine what that means to a person hit with the reality of a life cut short and countless hours of time spent in sterile hospital rooms and treatment facilities. 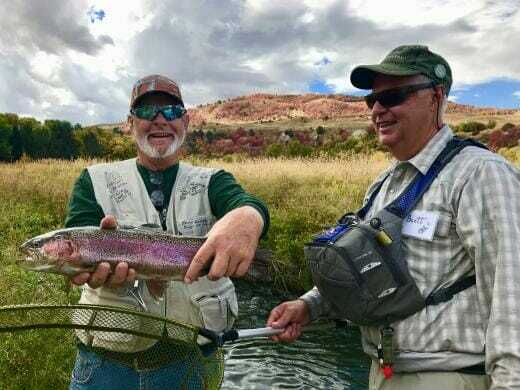 A fishing buddy for Reel Recovery and a participant from a recent retreat celebrate a landed trout. Brett Prettyman photo. 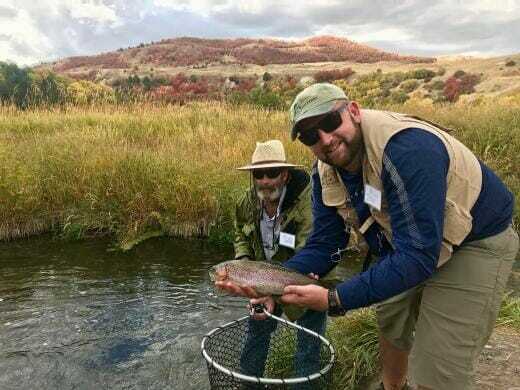 Trout Unlimited members across the country help serve as fishing buddies at the Reel Recovery retreats. 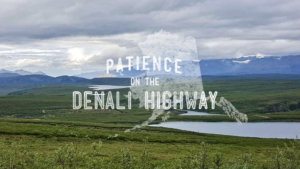 These buddies not only form strong relationships that often lead to fishing trips outside of the program – they also help the non-profit groups providing the retreats serve more participants. Reel Recovery is just one example of groups out there providing people with the chance to get away from the heavy burdens of illnesses (physical and mental). 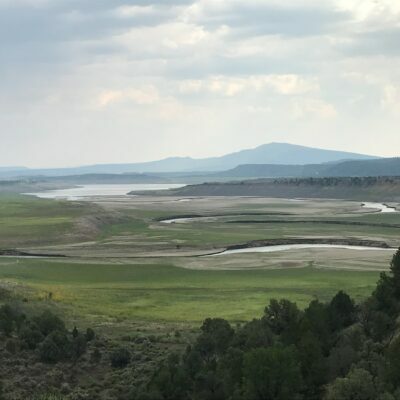 Among the others: Casting for Recovery – serving women with breast cancer; Project Healing Waters – active military personnel and disabled veterans; and Trout Unlimited’s own – the Veterans Service Partnership (serving veterans, active duty military and their families). I’m sure there are many more groups out there and I’m sorry for not being able to list them all, but you don’t have to be an official volunteer to make a difference just by taking someone fishing. If you haven’t already offered to help others experience the healing qualities of fly fishing consider making an effort with a family member, friend or someone in your community who just needs to get outdoors. Remember that feeling of catching your first fish or watching a child or other family catch their first? Multiple it by three and you might equal the joy of watching a participant at a fly fishing retreat catch fish.